Bible as Literature…..Questions the Bible poses. Was the Fruit in the Promise Land Abnormally Large? I don’t know about everyone, but when I go to the store to get grapes I do not need an extra man and a pole to carry them to the car. However, the Israelite spies in Numbers needed just that. When the spies went into the land of Canaan they were told by Moses to bring fruit back from this promise land. They were told to do this in order gage this new land of milk and honey. The land proved to be very fruitful. 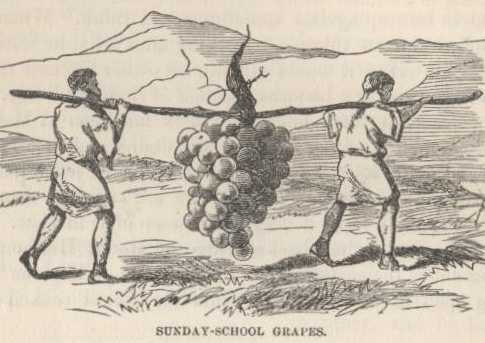 From the Valley of Eshcol, they brought a single cluster of grapes that required two men to carry. After reading Numbers 13:23 the verse were the grapes are listed, I began thinking about exactly how large this cluster of grapes must have been. According to the Guinness World Records’ the largest modern cluster of grapes was grown by a man in Chile and it only weighed almost 21 lbs. That is the weight of a small child. Assuming that two men had to carry the cluster from the promise land I think it is safe to assume that the cluster referred to was heavier than 21 lbs. Was the fruit in this promise land abnormally large? After doing some research on this verse in Numbers I learned that some people believe the meaning of Eshkol is actually means cluster (Cole). This land or valley could have been named after the agriculture that was produced from this area. I then started looking in to the modern area and what the agriculture was like today. According to Israel’s tourism website the land of Canaan was among the first countries to produce wine, and was known for their grapes. They started producing wine in this area thousands of years before Europe ever thought about producing wine. Many ancient artifacts were found with grape vines and clusters on them. So now we now the area was known for their grapes, but exactly how larger were they? Can we even say? The Hebrew writers and the people place a lot of emphasis on grapes in the Old Testament and the New Testament. According to Genesis one of the first things to be planted after the great flood were grapes. (TCFNJ.com). It is of course possible that the grapes were a symbol of Yahweh’s promise about the promise land to the Hebrew people. No one can say exactly how large the grapes from the promise land were, but we do know that they had the potential to be larger than the average grocery store grape, and that they were important to the Hebrew writers. Does Ephesians Condemn any use of Alcohol? Have the prophecies of the seven trumpets already been fulfilled? What does Babylon mean in 1 Peter 5:13? Why is Galatians Considered the Magna Carta of Christian Beliefs?